Not everyone gets to turn their passion into a profession. But fashion designer Jay Baek says he is fortunate to have built a career out of something he’s loved doing since his teenage years: making clothes. 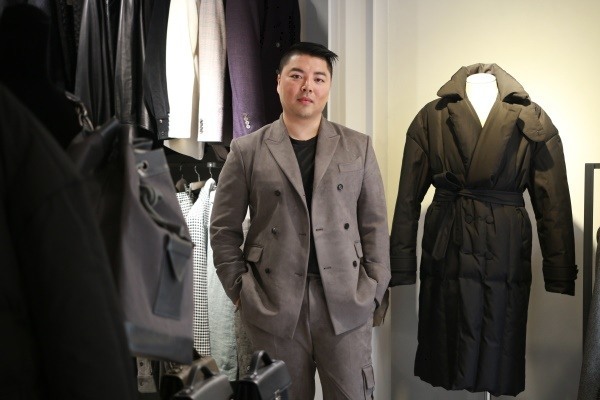 “As far back as I can remember, I just loved clothes very much,” said Baek at the Jaybaek Couture showroom in Hannam-dong, central Seoul, an elegant and simple space inside a gray brick building with a neat monochromatic collection of his clothes on display. Thanks to his mother, who owned a small boutique and designed clothes, he developed a keen fashion sense early on. It wasn’t that Baek preferred expensive or branded clothes, but the designer felt his clothes needed to express his individuality. Jaybaek Couture, which began in 2012, centers on custom-fitted apparel, including tailored suits, tuxedos and formal dresses, as well as casual apparel. The brand is still young compared with the goliaths of big fashion houses here, but it is one of the most sought-after names among local fashion stylists for its artistry and precision. Baek designs various items, from sleek suits to leather jackets, silk dresses, and corduroy skirts and bags, to name a few. From time to time, he also designs wedding gowns. When the items appear on display together in his showroom, though, they all share a quality that is distinctive to the Jaybaek line. “The collection is based on classic, but with a modern tweak,” he said. As examples, Baek pointed out a puffer jacket with a tuxedo-style collar and some casual items with just a touch of tailoring -- it’s the details that set the garments apart as his work. He is not afraid of tossing elements of the Korean hanbok into modern apparel, such as the wool coat he designed with Korean traditional quilting, called “nubim,” or the leather jacket with the flowing lines and gentle curves of a hanbok. Baek’s art -- that of combining seemingly opposites -- influences how he designs menswear and womenswear, as well as how he dressed on the day of the interview, pairing a tailored suit with cargo pants and walker boots. He is open to experimenting with new materials. “It would be fun to make a tuxedo out of Korean traditional ramie fabric, or a bow tie out of Korean hemp fabric,” he said. Well, that sartorial magic has to come from somewhere, right? Carrying on that inspiration, he has dressed some of the most-watched celebrities in the industry. From actors such as Park Bo-gum, Hyun Bin, Park Seo-joon, Gong Yoo and Lee Jong-suk and actresses Honey Lee and Kim Hye-soo to K-pop stars like GOT7, SHINee, EXO and, most recently, BTS, many stars wear suits and dresses crafted by him on important occasions. 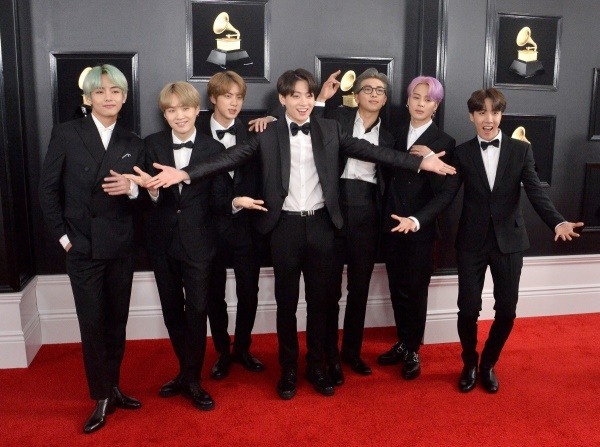 Just last month, when K-pop sensation BTS took the stage at the Grammys as presenters -- the first time any Korean band has had that honor -- the musicians wore custom suits from Jaybaek Couture and another local designer, Kim Seo-ryong. When he sees stars donning his attire at important events, Baek says he is humbled and wants to work harder to become an even better designer so his work can light up the red carpet. Some of Baek’s most memorable moments were at the Busan Film Festival last year and the year before, when a number of A-listers wore tuxedos and dresses he’d designed -- including actor and festival host Kim Nam-gil, as well as actresses Kang Soo-yeon and Moon Geun-young. Actor Kim Nam-gil, wearing herringbone silk tuxedo from Jaybaek Couture, walks with actress Han Ji-min at the Busan Film Festival in October 2018. He also spoke about what an honor it was to dress seasoned comedian Lee Young-ja last year when, clad in Baek’s signature black tuxedo, she became the first woman to receive the grand prize at the KBS Entertainment Awards. Shortly thereafter, she wore a white tuxedo he’d designed to the MBC Entertainment Awards, where once again she took home the top honor. Whether they are stars or average people, Baek approaches all his clients with the same attitude. “To everyone who walks into this showroom, I start the designing by falling in love with them first and finding their beauty. He wants to reach more customers and is currently preparing to launch a ready-to-wear line later this year. And in response to growing attention from fashion buyers overseas, he plans to take his collection outside Korea. Through his previous roles at fashion houses, he is well aware of the enormous amount of work that will entail. “We want to enter other markets, hopefully soon, when the time is right,” he said.